Haven't received anything? please contact support@irishwins.co.uk for assistance. register today it's quick and easy! Hello there and welcome to Irish Wins. We are a brand new slots site for 2019 packed full of the best online slots and games. We’re all about having having a good craic and nothing too serious. We offer over 650 amazing games from the industry leading game providers. This includes games from Netent, Blueprint Games and Microgaming. Top games to look out for include the popular Irish themed Rainbow Riches, Fluffy favourites and Starburst. Irish Wins launches new games every month to be sure, so make sure you keep coming back and see what’s new. If you really think that you have the luck of the Irish then check out our range of progressive jackpot slots. We have over 35 jackpot slots that are bursting with big jackpots that are ready to drop. Check out the 3 Fluffy Favourites jackpot games that are all based around the original versions of the popular slot. We also have two lucky Irish themed jackpot slots with Irish Luck and Kiss Me Clover. Someone has to drop the jackpot, we wish you the luck of the Irish. All new funding members at Irish Wins will be rewarded with a spin on the Mega Reel. Players need to make a deposit of £10 or more to activate their spin. The Mega Reel is a wheel with multiple segments offering different rewards. Prizes range from Amazon vouchers to extra spins on Starburst and Fluffy Favourites. 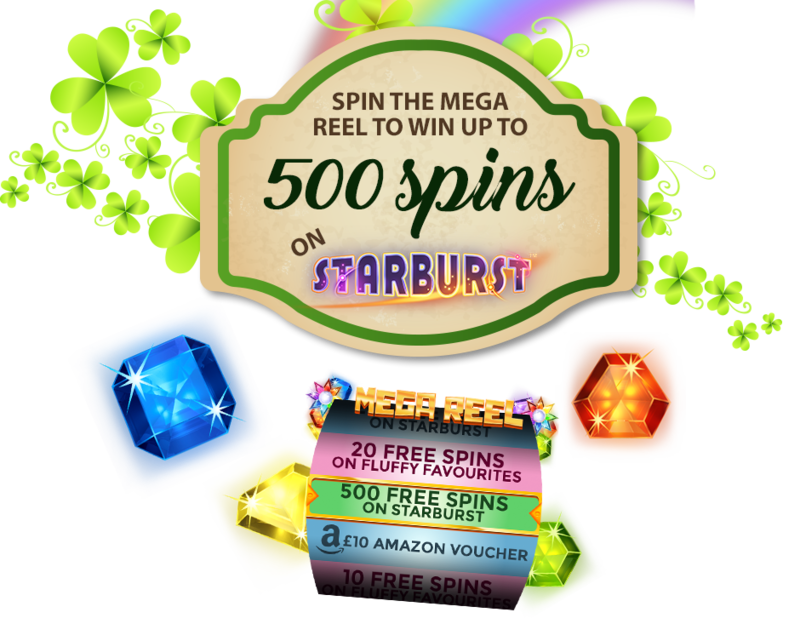 The top prize on the Mega Reel is an 500 extra spins on Starburst. If you’re looking for something different from a new slots site for 2019 then check out our trophies page. We have set challenges for you to conquer to receive trophies. When you complete a combination of challenges you will be rewarded with another spin on the Mega Reel. As you gather trophies, you will unlock new levels which award better prizes on the Mega Reel. Most trophies can be claimed at your convenience meaning you can claim a spin on the Mega Reel when you want. Many trophies can be achieved just for playing your favourite games. Irish Wins accepts several payment methods making our website accessible to all. We like to feel that we have a payment method to suit everyone. Payment methods we offer include debit/credit card, Paysafe, Paypal and Pay by mobile. If you plan to deposit via Paypal, you can also benefit from the fast registrations process. Click the link on the registration form if you want to save time and register via Paypal. Pay by mobile is also a handy method if you would prefer to make a deposit and just add it to your mobile bill. The clue is in the name, Irish Wins loves a winner. We like to keep players happy and we know a nice win from time to time does just that. We only launched in 2019 but already we have had several big winners. We want customers to enjoy their experience at Irish Wins and we want to keep you playing at the site. The games that we offer on site vary in volatility which means that they pay out in different ways. Some slots will pay little to medium payouts but often where as other slots will pay less often but larger amounts. It all depends on what you are looking for from your experience at Irish Wins. We have some big progressive jackpot slots if you're looking for a super win but remember these slots will not pay out as regular as a non progressive slot. We recommend that you try out as many slots games as you can and find the right slot for you. We hope Irish Wins brings you the luck of the Irish and remember to take your spin on the Mega Reel. A deposit of just £10 can give you a chance to win up to 500 extra Starburst spins. Keep track of your progress on the trophies page and see how close your are to achieving another spin on the Mega Reel. Climb those levels to claim enhanced rewards and prizes on the Mega Reel. Check out our promotions page for more exciting perks including Pizza Club. You heard us correct, we give players the chance to win free Pizza. Just something else for you to get stuck into at Irish Wins. Irish Wins is operated by Jumpman Gaming Limited which is licensed by the UK Gambling Commission ('UKGC') for customers in Great Britain and the Alderney Gambling Control Commission ('AGCC') for customers outside of Great Britain. All games on Irish Wins are regulated by the UKGC or both the UKGC and AGCC. Registered business address (no correspondence): Inchalla, Le Val, GY9 3UL, Alderney.